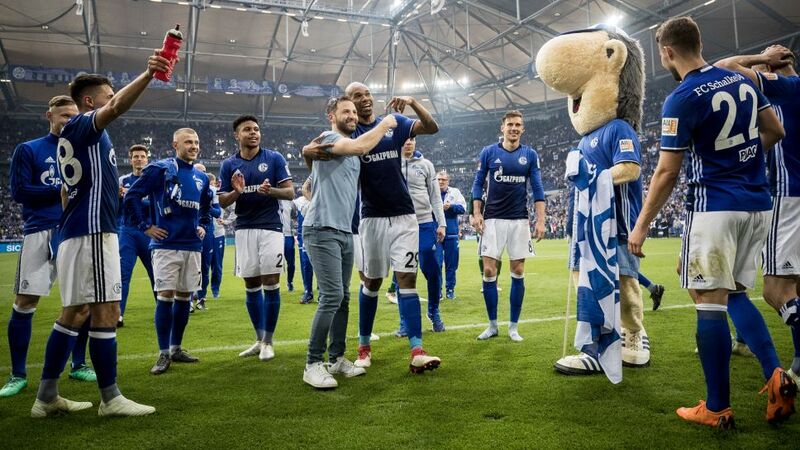 When Domenico Tedesco signed his contract extension at Schalke recently, he talked about the enjoyment he got from working with his team - "because they're always ready to take the next step." Given they were impressive and deserved runners-up to Bayern Munich last season, the logical answer would be, "Challenge for the title." Schalke fans have never seen their side win the Bundesliga, and the last of their seven national championships came in 1958, so a title tilt is the stuff of their dreams. But the reality that there was a 21-point gap between Bayern and the Royal Blues come the 2017/18 season's end will shake them back into the here and now. It looks a gulf in quality that is too cavernous to be spanned this term, but there is still certainly room for improvement. Schalke's second-placed finish was quite a step forward in itself given the club had not claimed a place in the top four in the previous three campaigns. So the first big challenge will be to establish the Gelsenkirchen outfit as major contenders on an annual basis, and Schalke appear to be going about doing that the right way. The return to the UEFA Champions League will certainly help the cause. Not only will it give the club's coffers a significant bump to ensure greater muscle in the transfer market, it will also add quality experience of the very highest level to a squad that is not best stocked in that department. It will be an unforgiving testing ground for the squad, notably the younger players like Weston McKennie and Amine Harit, but the way they strode confidently through Bundesliga matches last season makes you suspect they will grow, not shrink, when faced with the stiffest challenge in club football. It will be a major part of Tedesco's job to ensure they do that and that his side do not succumb to 'second season syndrome', that curious quirk of football that sees a team enjoy unexpected, wild success one season only to prove unable to repeat the trick the next. The same is true of the Schalke boss himself, who is going into only his second full campaign as a head coach. The 32-year-old clearly has the backing of his bosses though after being given a three-year contract extension just 12 months into an initial two-year deal, quite a sign of their faith in his abilities. It also helps bring stability to a club that saw 11 coaching changes in just eight years before the bold decision to hand the largely untested Tedesco the reins just over 12 months ago. That appointment was partly the brainchild of Christian Heidel, who — as the club's sporting director — is bringing the same sort of level-headed, top quality decision-making and shrewdness in the transfer market he showed in establishing Mainz as a Bundesliga force. In the football world where brinksmanship is the norm, Heidel's best summer business was concluded before winter had finished. Mark Uth's arrival from Hoffenheim was assured in January — on a free transfer too — while the signing of Salif Sane, so impressive with Hannover last term, was also wrapped up well before the 2017/18 season was done and dusted. While the pair may not have the names to get fans in a frenzy, they are just what Schalke required. The Gelsenkirchen outfit had the third-best defensive record in the division — behind champions Bayern and VfB Stuttgart — and the addition of Sane will surely make them an even more formidable barrier to opponents' ambitions. The Senegal international won more challenges than any defender in the Bundesliga last season, and chipped in with four goals, an important factor for a Schalke side that topped the division in set-piece goals scored. As he turns only 28 in late August and measures 6'4", he is basically a younger version of Naldo, the 35-year-old evergreen Brazilian with whom he will form a fearsome centre-back duo. Since the prolific days of Klaas-Jan Huntelaar, Schalke have been on the lookout for a goalscorer, and they now have one in Uth. The industrious forward, who turns 27 this month, is something of a late developer, but the 14 goals and seven assists he registered for Hoffenheim last season suggests he is determinedly making up for lost time. Suat Serdar and Omar Mascarell, picked up from Mainz and Eintracht Frankfurt respectively, have the daunting task of compensating for the departures of Leon Goretzka and Max Meyer, two homegrown heroes of the Ruhr Valley. While Serdar, 21, insists he is not interested in comparisons with Goretzka, they will naturally be made, meaning he will need to make the step up to ensure they are favourable. Mascarell, once of Real Madrid, comes with a billing that suggests he can join compatriot Raul among Schalke's Hispanic heroes. Their arrivals give Tedesco greater strength in depth to work with as he attempts to mastermind a potentially sapping three-pronged challenge in the Bundesliga, DFB Cup and Champions League. "If you ask me personally, I can only say that for me there's nothing nicer than being able to play football matches every three or four days. It's a lot better than 'only' being on the training pitch. I'm not worried at all about playing in three competitions," striker Guido Burgstaller told bundesliga.com recently. "I'm convinced that the squad has more depth than last season," the Austrian added. "And our coach has a keen sense of how he has to manage the workload of each player. That's why I see us as well-equipped." If Heidel manages to weave a little more of his unique brand of magic in the remaining days of the transfer window, Tedesco may be even better armed to ensure Schalke take that next step.